When you think of love, your mind probably doesn’t turn to an ancient place of execution. But the cross of Calvary, where Jesus Christ died 2,000 years ago, was the place where the greatest ever act of love was shown. Certainly no love was shown by the men who betrayed Jesus, falsely accused, unjustly condemned, and crucified him. But it was God’s love that sent Jesus to the cross. And it was love in the heart of Jesus that moved him to submit, willingly, to all the indignities and cruelties that he suffered. We don’t often hear the word ‘propitiation.’ It means paying a price that satisfies and soothes anger, covering over wrongdoing. We are all guilty of much wrong thinking, speaking, and doing towards God. The Bible calls this sin. We live as if God is irrelevant or even non-existent. We live by our rules, not his. We do not honour him as he deserves – our Creator and Provider and King. Our sin cuts us off from knowing and enjoying God. We cannot be at peace with him. But out of his perfect love God planned a way to pay for and cover our sin so that he can accept us. He sent his own dearly loved Son, the Lord Jesus Christ, as the propitiation. On the third day after Jesus died God raised him to life again. This proved that Jesus’ sacrifice had been accepted. He now lives – today and forever – and calls everyone to turn away from their old life of sin, and come to him. You can know forgiveness and peace with God. You can know and enjoy his love – ‘vast as the ocean.’ It is found only in Jesus. Ask him today to cover your sin and give you new life. You would be very welcome to come along to any of our Easter services. Good Friday Service 19th April 10.00-11.00am Get to know us better over seasonal refreshments afterwards. 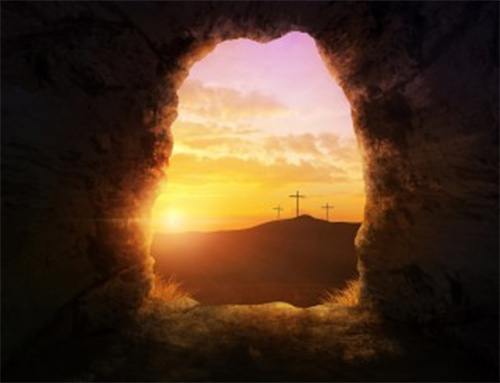 Easter Sunday Services 21st April 11.00am -12.15pm and 6.00pm-7.15pm.